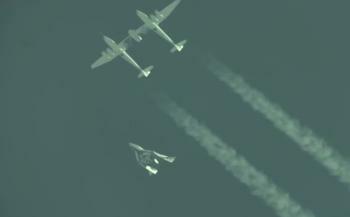 Virgin Galactic’s SpaceShipTwo (SS2) finally conducted its debut powered flight on Monday, paving the way towards its space tourism aspirations. The historic milestone was conducted high over the Mojave desert, as the RocketMotorTwo engine roared into life, propelling the spacecraft to supersonic speeds. Virgin Galactic have been waiting to carry out the powered qualification flight of their SpaceShipTwo (SS2) passenger vehicle for some time now, ahead of launching celebrities and rich people on a short suborbital joyride. The company current holds deposits from over 500 customers, allowing them to buy the honor of being called an “astronaut”, although that title is based solely on the altitude of their flight. 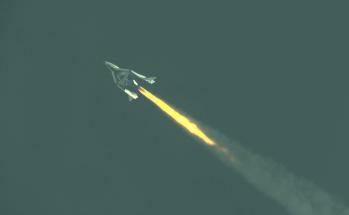 The effort has suffered from numerous delays, not least since Virgin head Richard Branson claimed they would be ready to launch passengers by 2008, as the Virgin PR drive – that included some baffling references to the Space Shuttle – upped the pace around the test flights of SpaceShipOne (SS1). Monday’s milestone is, however, a big step forward for Virgin Galactic, as the stunningly beautiful SS2 enjoyed its first powered test flight using its throttleable hybrid rocket engine, fueled with hydroxyl-terminated polybutadiene (HTBP) and nitrous oxide. 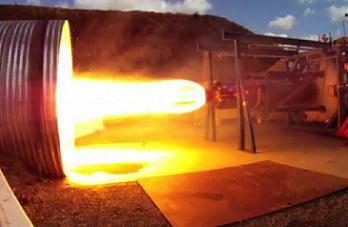 The RocketMotorTwo engine was designed and built by Sierra Nevada Corporation (SNC), the company that is also developing its own space plane, the Dream Chaser – which will be tasked with far more illustrious missions to transport actual NASA astronauts to the International Space Station (ISS). The propulsive test began at 7.02am local time when SS2 took off from Mojave Air and Space Port mated to its impressive WhiteKnightTwo (WK2) carrier aircraft – which was controlled by Virgin Galactic’s Chief Pilot Dave Mackay, assisted by Clint Nichols and Brian Maisler. Piloting SS2 were Mark Stucky and Mike Alsbury – test pilots for SS2’s designers, Scaled Composites, which built SS2 for Virgin Galactic. Upon reaching 47,000 feet altitude and approximately 45 minutes into the flight, SS2 was released from WK2, as it will during real flights. Shortly after, the pilots triggered ignition of the rocket motor, causing the main oxidizer valve to open and igniters to fire within the fuel case. With SS2 propelled forward and upward to a maximum altitude of 56,200 feet, the 16 seconds firing saw SS2 go supersonic, achieving Mach 1.2. Several additional powered flights will take place – expanding the spaceship’s powered flight envelope – ahead of the “realistic goal” – according to Virgin Galactic – of suborbital test flight by the end of the year. “The rocket motor ignition went as planned, with the expected burn duration, good engine performance and solid vehicle handling qualities throughout,” added Virgin Galactic President & CEO George Whitesides. “The successful outcome of this test marks a pivotal point for our program. 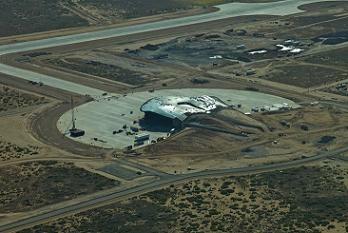 It is not yet know as to when commercial passengers will be able to board a SS2 from the newly built Spaceport America in New Mexico. However, this date is now fast approaching, following Monday’s success – earning praise from numerous areas of the space flight community. “The Commercial Spaceflight Federation congratulates the team at Virgin Galactic and Scaled Composites for the first powered test flight of SpaceShipTwo today,” noted CSF President Michael Lopez-Alegria. “This incredible achievement is the direct result of the hard work and dedication by these two companies, as well as by RocketMotorTwo developer Sierra Nevada Corporation. From Sir Richard, his own goal of flying on SS2 also took a step closer on Monday.